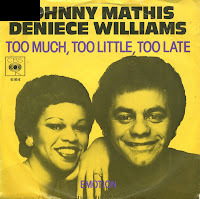 Johnny Mathis' 1978 album 'You light up my life' featured two duets with Deniece Williams. Both duets are included on this single, with 'Too much, too little, too late' as the lead track. It became Johnny Mathis' comeback hit, peaking at number 1 in the US Billboard Hot 100 chart, his first number one since 1957's 'Chances are'. The single also reached number 3 in the UK singles chart and the Dutch Top 40. The success of the duet with Williams prompted Mathis to record duets with a variety of partners including Dionne Warwick, Natalie Cole, Gladys Knight, and Nana Mouskouri. Mathis and Williams also recorded a follow-up duet album entitled 'That's what friends are for', however 'Too much, too little, too late' was not included on that album. 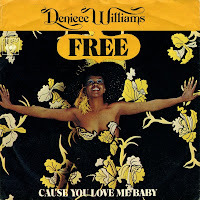 Deniece Williams was born on June 3, 1950. She started her career with the 1976 album 'This is Niecy', containing the hit single 'Free'. Every year she released a new album, until a short break in 1980. In 1981, her album 'My melody' was released, containing this single, 'It's your conscience'. Like most of her material, it was a softpop song. I heard this song on a compilation album I bought in the late Eighties. A decade later, I bought the single. Just for completeness sake: if you know a good single, you have to have it, right? 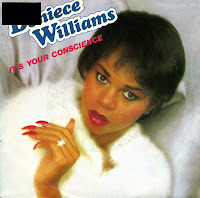 Born as June Deniece Chandler, Deniece Williams debuted in the Seventies when she performed backing vocals for Stevie Wonder, together with Minnie Riperton and Syreeta Wright. In 1976, she signed to Columbia Records and recorded her debut album 'This is Niecy'. The first single from this album was 'Free'. It reached number 25 in the US Billboard Hot 100 singles chart, and in the UK it topped the chart for two weeks. I got to know the song because of a compilation cd and eventually when I came across the single, I bought it.